Let me emphasize you do not need to know anything about bridge to read R.J. Lee's debut cozy mystery, Grand Slam Murders. I've never played bridge, and I know nothing about it, but the entertaining Southern characters will bring me back for the next challenge. Wendy Winchester has a journalism degree, and she's chafing at her role as society reporter for her hometown newspaper. However, the elderly newspaper editor believes Wendy does a fine job covering engagements, weddings, and the social events in Rosalie, Mississippi. She's even managed to become the second substitute in the Gin Girls' bridge club. The Gin Girls are four wealthy widows, the doyennes of the town, who have been eccentric since they were in high school. Nothing these women do can shock the town anymore. However, when they all keel over before their bridge game, dead of poisoning, that does shock everyone. While the crime reporter covers the murders, Wendy is given the task of interviewing family members and telling the story of the Gin Girls. She relishes the task, and finds a way to even interview the two suspects, Liddie Langston Rose's maid/cook, Merleece, and the gardener. It seems before Liddie died, her last act was to point to the two of them, and say, "You!" And, of course, some of the men in town are eager to pin the murder on the black maid who poured the drinks for the Gin Girls. Wendy is convinced, with some advice from her father, the police chief, and her on-again, off-again boyfriend, a cop, that she's the one who can put all the puzzle pieces together to find the person responsible for the death of the Gin Girls. While Wendy is a little too over-the-top sweet at times for me, the cast of characters is a treat. It's a Southern town, with Mississippi politics and views, which the author knows well. It may be R.J. Lee's first mystery, but the twist at the end shows a clever hand. Fans of fun southern mysteries will be watching for the next Bridge to Death mystery. 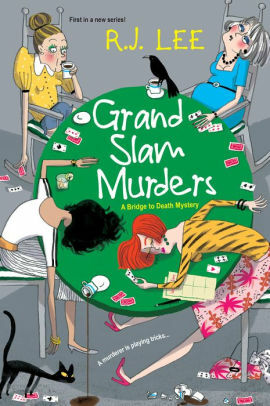 Grand Slam Murders by R.J. Lee. Kensington, 2019. ISBN 9781496719140 (paperback), 304p. I think this one sounds fun, Lesa, though I know nothing about bridge either. I'll keep it in mind. I'm sending my copy to a friend who plays bridge, and her name is Wendy! It will be perfect, Kay. Don Von Elsner wrote two series where bridge was a unifying theme, and they were still entertaining. The David Danning is a hard boiled detective series, and Jake Winkman is a lighter spy series. And speaking of spy series, there was a fixed bridge game in the James Bond novel MOONRAKER - apparently added in because Ian Fleming's original story was too short. It involved slipping a stacked deck in so the suspected cheater would bet - and lose - a lot of money to Bond.